You don’t want to make the same mistake as me and buy materials that you don’t end up using.Next week I’ll walk you through step-by-step on how to do it. But for now let’s gather up everything we’ll need. I don’t kid around when it comes to handling lye. No it doesn’t have to be as scary as some make it out to be, but safety measures are an absolute must. I suggest you read this post on lye safety. Important: if you’re using any tools from your kitchen you CAN’T use them again for food prep or eating. 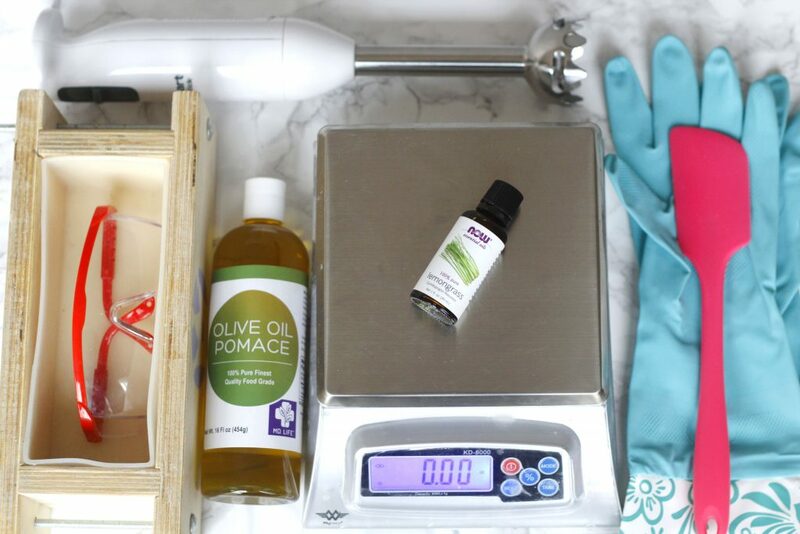 Whatever got in touch with lye, soap or essential oils has to become your designated soapy tool, you want to avoid any soap residue seeping into your food. Mold: you will need something to pour your soap batter in once it’s all mixed up. This could be as simple as a bunch of empty yogurt containers or a small cardboard box lined with freezer paper. We’ll actually use an empty Pringles can when we make soap next week. Single cavity molds like this one are great for beginners too. They can give you a nice design without having to worry about having to cut bars. Containers to measure and mix your lye: You can use an empty yoghurt container to measure your lye. And a plastic take out container for your water and for mixing. You want to avoid aluminum since it will react with the lye. Glass is not recommended either since the water lye solution becomes very hot initially and may cause the glass to crack. Another container to mix and melt your oils: I like to melt my oils on the stove top, so I “sacrificed” an old saucepan. You can melt oils in the microwave on 20 second bursts, that’s fine too. For that you will need a heat resistant plastic bowl. I use these very cheap measuring containers I bought at IKEA. Stick blender: buy a very basic one, like this one. Thermometer: You’ll need a thermometer to check the temperature of your oils and lye solution. I splurged on an infrared thermometer which is easy to use and less messy. But you can easily get away with using a very simple one like this. As a matter of fact you might find that as you have more experience and get a better feel for trace (different levels of saponification) that you don’t even need to use a thermometer anymore. Lye: comes in beads or flakes, both ore good to use. Most hardware stores sell lye to drain pipes. Check the expiration date, lye can go bad and won’t work. I buy mine here. Oils: I use vegetable oils but you can also use tallow (beef), lard or other animal fats. The more common and least expensive ones are coconut oil, palm oil, rice bran oil, pomace (olive oil) and castor oil. Although you can buy them at your local grocery store, I wouldn’t (except for coconut oil maybe). You run the chance of buying oils that are rancid or past their prime. Buy the smallest amount you can get, you don’t want to end up sitting on a tub of castor oil. Distilled water: you can’t use tap water for soap making it contains minerals and impurities that will give you ill results. Most supermarkets carry it. Is there any all nature products I can use in making the soap . Hi Deanna, thank you for your question. I hope I’m interpreting it correctly. Do you mean: Can one make soap without Sodium Hydroxide (lye)? Unfortunately, one cannot make real soap with out lye. It’s what will turn your natural oils into soap. Without it, it just won’t work. In the finished product, however there is no more lye present. It has reacted with the oils and is now soap. I explain a little more about the process in this post. this post. I have decided to make soap and already have been cautiously collecting items. I live in Canada, and unless I buy lye online I can’t find any here. When I was in the US shopping I looked all over. I only found lye liquid drain opener. No other additives. I can’t find this addressed anywhere online. Do you have advice or direction please? Happy to email in if you prefer. Adore your articles! Thank you for sharing. …continued for Kimber: It seems like it would be ok to use. You will have to add distilled water to it if it’s a 50/50 solution. That would be to strong. I would aim for 65% water, 35% lye. Try home hardware. They carry lye. Do you know a brand name? I took a soap making course at Molloys in Cambridge Ontario. You can buy all soap making supplies there. They do have a website. If you ever come visit out this way maybe you could pop in or call them. I am currently in Brantford! I will have to make a poiyto go and visit them. Thank you so much! I detest to waste. The article was excellent. I wasn’t successful finding anything on my own where I could be sure of the quality of the information. I trust your judgement. I was just able to aquire Roebic crystals and the bottle states 100% sodium hydroxide. This therefore is what all the standard recipes are referring to? I purchased my cheap stick blender also. I am excited but terrified to try my first batch! Is it ok to say that the calculator is terrifying? There are so many places to make a mistake! Such a blessing thank you. So confusing that I am only able to understand recipes that specify all the ingredients specifically. I will go look for that video! It took me a really long time to be able to create my own recipes. In the beginning I stuck closely to other people’s recipes. It wasn’t until I took a class specifically for that, that I felt comfortable enough to make up my own. You’ll get there! You are most kind and encouraging. Thank you from the bottom of my heart! I will stay the course. Perhaps I will even find a class near where I live! If not, I can make due with instructinoal videos and training. I am excited to learn! You said to use Distilled water, I have a well, can I use my tap water? Hi Zandy, many soap makers use well water successfully in their soaps. You want to stay away from hard water as it contains a lot of metal ions. Impurities or metal in the water can lead your soap to go rancid aka develop “dreaded orange spots”. Have you ever had the well water tested? I would give it a try – make a small batch and see what happens. 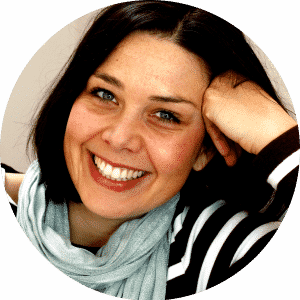 Hi Celine, thank you for the tips, what natural colourant can I use for the cold process soap. I started making the melt and pour glycerine soaps, at what temperature should I melt the soap, I’ve experienced a film and scum while melting. With the Glycerin Soap you can prevent a film from forming by covering your soap with cling or ceran wrap while you’re heating it. 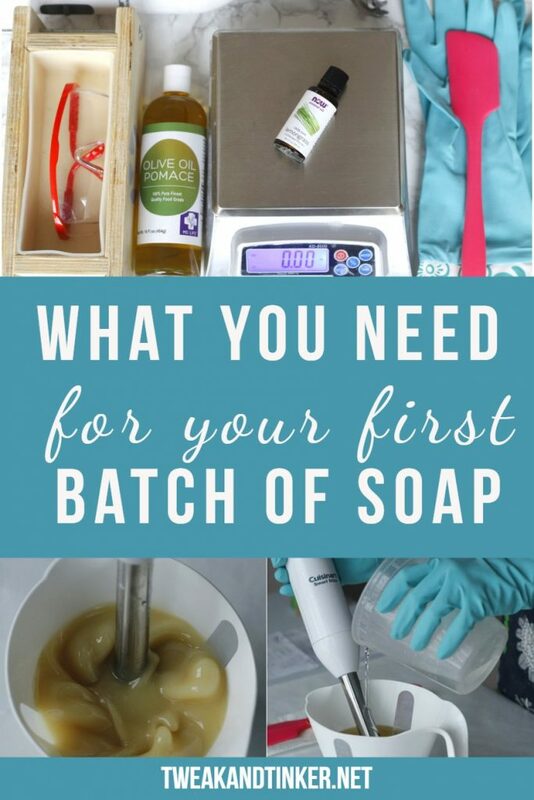 I’ve never experienced scum… Are you using a good quality soap base? Thank you for all the valuable information! I’ve been making soap for almost a year and rely on other peoples recipes. Today I used turmeric to color my soap orange but it ended up looking rather gross! More light brownish. I used vegetable shortening, coconut oil and olive oil in my recipe. Could it be that the original soap was an off white to start with? Is there some other oil that will give me a whiter soap? Olive oil used in big quantities can certainly leave a greenish/yellowish tint in your finished soap. I’ve never used in soap before, but I’ve played around with other natural colorants, see my post here. The color shade and intensity also depends on how much tumeric you used and whether you added the tumeric to the lye solution, your oils or if you did an oil infusion. Your soap might also lighten up in the curing process. Hi Debra, that’s a good question and also a tricky one. It depends on what kind of oils you use, what kind of essential oil or fragrance oil, if you’re buying your supplies in bigger quantities etc. But if you’re sticking to more cheaper oils (coconut, tallow or palm, canola) and essential oils like lemongrass or peppermint/ spearmint a bar should cost you between 1.50 – 2 $. Again I encourage you to do your own math to figure out your cost and don’t forget to factor in your packaging. Hello! 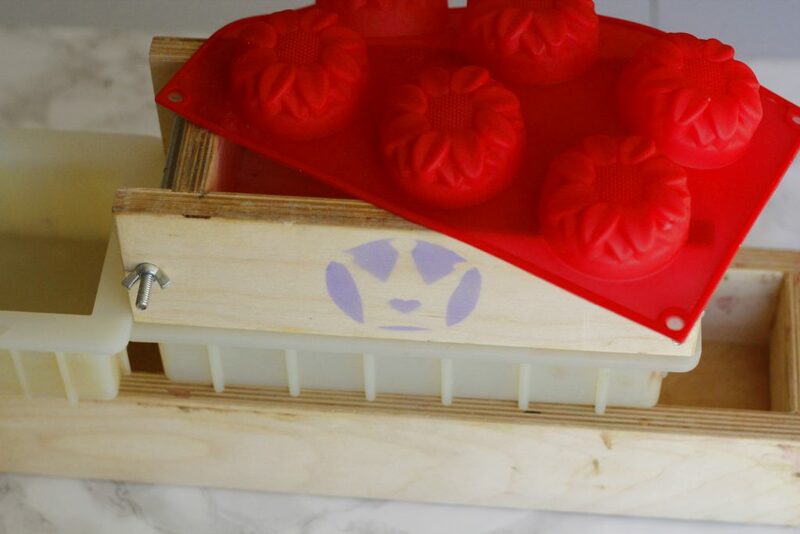 If I use my silicone mold to make soap I cant use it for baking or anything else? Or the knife to cut it? Even if you wash it? Newbie here. Thanks! I wouldn’t use the mold or knife for anything else but soap. You don’t want your food to be affected by any remainders if fragrance or essential oils. Hope that help. I was excited to find you. I am thinking about trying the heat and pour goats milk soap mixture that I can add to instead of doing the cold press method, where I can add fragrance and color. What sort of mold do you Suggest? Hi Glenda, for melt and pour soap I recommend silicone soap molds either with single cavities or in loaf form, that you’ll have to cut into bars. Happy Tinkering!